Alan Bartram, who died earlier this year, is a quietly important figure in the development of British book design and typography. He wrote and designed significant books that have inspired subsequent generations of graphic designers. With a sharp eye for lettering, he opened up to new audiences the particular world of everyday alphabetic detail in public spaces. Bartram was identified by historian Alex Seago (see Eye 16) as part of a ‘group of young visual revolutionaries’ who ‘transformed the face of British art, fashion, film, television, advertising, newspapers and magazines’ between the mid-1950s and early 1960s. 1 Bartram, originally trained in painting, was taught typography by his brother Harold, a teacher at the London School of Printing (now the LCC) and an advocate of a Continental model of graphic design training he himself had received as a pupil of Anthony Froshaug and Herbert Spencer at the Central School of Art and Design in London. On his arrival at the Royal College of Art in 1955, Bartram joined a generation of designers who reset the design agenda, shifting focus away from nostalgia and Victoriana towards the experimental and the avant garde. This can be seen in Ark magazine, the RCA’s in-house journal. Ark 20 (Summer 1957) was co-art-edited by Bartram and the designer David Collins (who later featured in 17 Graphic Designers London, Balding & Mansell’s celebrated showcase of the UK design scene in 1963). 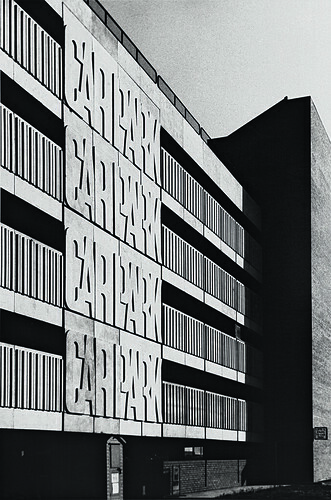 Concrete lettering from the 1974 High Cross multistorey car park in Truro, Cornwall, shown in Bartram’s Lettering in Architecture (1975). Top: carved street name, Bath. 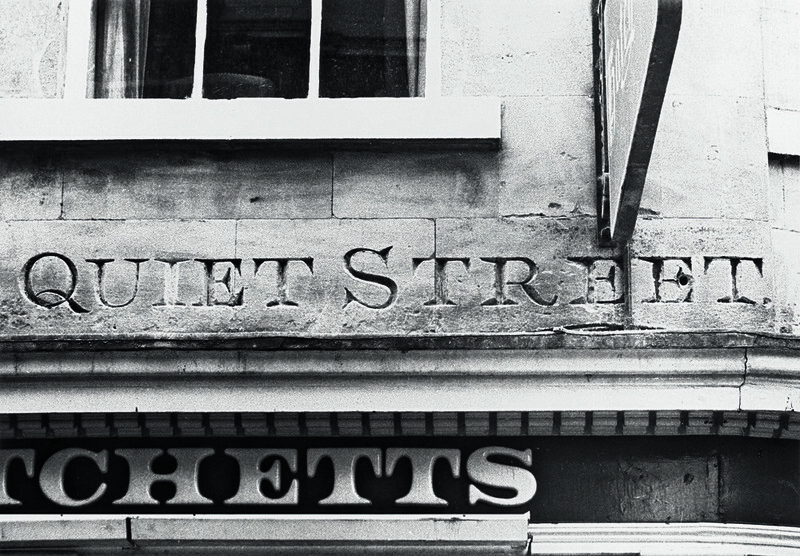 Collectively, Bath’s street lettering showcases the basic form of the so-called ‘English letter’. Bartram needn’t have feared. The Atlas remains a classic, uneclipsed by his own attempts at a successor two decades later. The working relationship with Taylor was to prove fruitful and enduring. Between 1975 and 1986, Lund Humphries published Bartram’s series of books on lettering: first Lettering in Architecture, (quarto hardback, 176pp), followed in 1978 by three smaller volumes (octavo paperback, 96pp) exploring in turn Fascia Lettering, Street Name Lettering and Tombstone Lettering in the British Isles, before his convincingly broad documentation of The English Lettering Tradition (quarto hardback, 180pp). All are densely illustrated, mostly using Bartram’s own black and white photography. Bartram took pictures of lettering on the many cycling trips he shared with his brother Harold. The photographs are now housed within the Central Lettering Record at Central Saint Martins in London. Most of the images are from the UK, but there are many from Italy, Spain and Eire. Public lettering had previously been addressed in the writing and images of authors Nicolete Gray and James Mosley (who continues to write at typefoundry.blogspot.co.uk), and by others in the pages of Typographica, but Bartram brought a new visual richness to the field. After Spencer, Bartram worked for IBM, designing booklets and other printed material, eventually taking on his former employer’s design role at Lund Humphries when Spencer left the publisher in 1986. His writing also shifted towards a greater preoccupation with the design of books. Of these, Typefaces for Books (1990), again with James Sutton, is notable for its careful illustration of the interrelationship between typeface, size and line-spacing on the typographic ‘colour’ of text, though it was scarcely current upon publication, given the rapid digitisation of font libraries then underway. Later books indulge his early love of the Modernist avant-garde. Bartram did not embrace the digital. Anyone visiting his West London flat would be impressed by the ordered lines of pens, brushes and jars of black and white gouache required for manual artworking. Letters from him were always written on a typewriter, hand-corrected with brown ink. The significance of his legacy lies in his very particular interpretation of a design atlas and his contribution to the recording of the British lettering vernacular. Long out of print (though widely available second-hand), such books are still packed with rewarding contents for the novice and the knowledgeable alike. 1. Alex Seago, ‘Seize the sans serif’, Eye no. 16 vol. 4, Spring 1995. 2. Alan Bartram, ‘British Graphic Design, The formative years’, privately distributed essay, 2009. 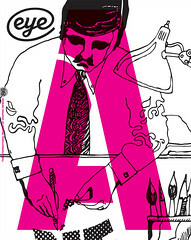 See ‘An Atlas of Typeforms’ in Eye 86. 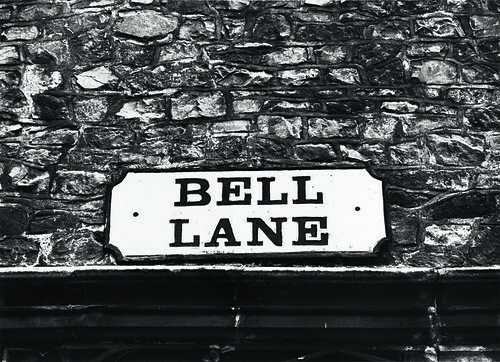 Cast-iron street nameplate from Bristol, described by Bartram in Street Name Lettering in the British Isles as being rather the worse for wear. The Egyptian form letters, unlike many cast letters, are not in relief but impressed into the surface.